We are one of the most preferred and reliable Manufacturer, Exporter and Suppliers of the Grub Screws. 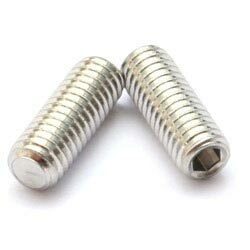 We delight the customers by offering premium grade and certified Grub Screws that are manufactured as per the customers need and requirements. The offered Grub Screws serve the purpose of various industries, sectors and other areas. Used against hardened surfaces or when frequent adjustments are needed and where no locking point is required. Cup point grub screws are the most commonly used of the various styles. The tip is slightly concave. Grub Screw - Knurled Cup Point : Use where vibration may be a problem. Knurls lock onto seating material and prevents screw from loosening. Grub Screw - Cone Point : For permanent location of parts. deep penetration of point gives the highest holding power. Cone point grub screws have a tip that tapers to a point. We stock metric sizes from M3 to M8. Grub Screw - Dog Point : Used for permanent location of one part to another. Point is often set into a drilled hole. May sometimes take the place of a dowel pin. Dog point grub screws are used where a positive engagement into a shaft slot (for example) is required. The tip is cylindrical and dimensions are shown on the listing page. Grub Screw - Flat Point : Used when parts must frequently be reset. Causes very little or no damage to the part it seats against.